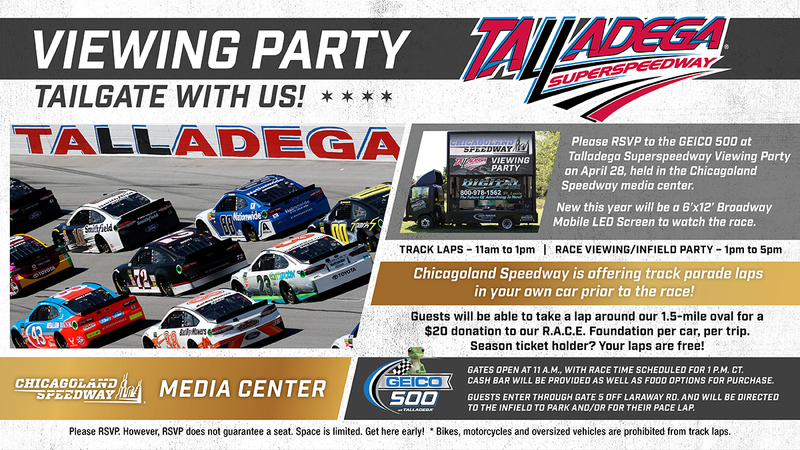 Please RSVP to the GEICO 500 at Talladega Superspeedway Viewing Party on April 28, held in the Chicagoland Speedway media center and on the infield. New this year will be a 6’X12’ Broadway Mobile LED Screen to watch the race on from the infield. Guests enter through Gate 5 off Laraway Rd. and will be directed to the infield to park and/or for their pace lap. You must RSVP, but please note your RSVP does not guarantee a seat. Space is limited, so get here early! * Bikes, motorcycles and over-sized vehicles are prohibited from track laps. 2. How many in your party? *This question is required.